Repairs to the Alaska Highway between Teslin and the junction of Highway 37 are expected to take days, according to Yukon's Department of Highways and Public Works. Repairs to the Alaska Highway between Teslin and the junction of Highway 37 are expected to take days, according to Yukon’s Department of Highways and Public Works. "We just need the water to recede a little bit so we can get a really good look at what we have," said Allan Nixon, assistant deputy minister of the department's transportation division, on Friday. "And we need to make sure that in the landslide areas that it's safe for our crews to get in and finish cleaning up the areas and then it's safe for people to start using the road again." 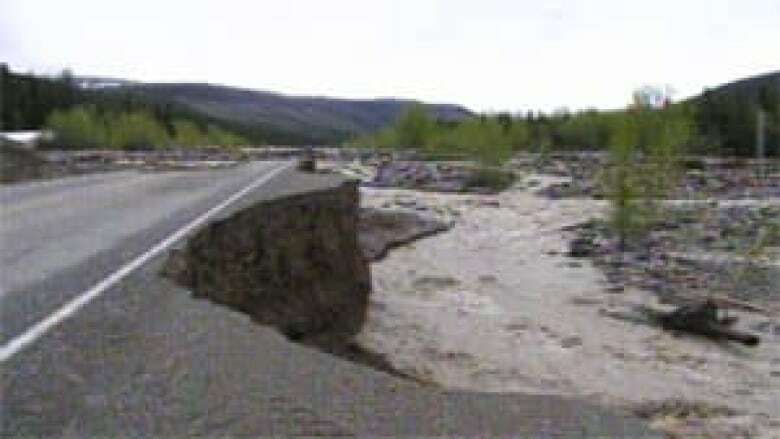 The department is asking motorists not to travel down to Teslin or up to Watson Lake and wait it out. There are no accommodations available and stranded travellers are putting a strain on the resources in those communities. Equipment was being mobilized and bridge parts being assembled and transported to the site on Saturday. As soon as water levels allow, crews will begin channelling Canyon Creek from four channels into one. Once this work is completed an engineering assessment can be completed and a temporary detour constructed. This process is expected to take days. Crews opened a lane to Watson Lake Friday night for emergency travel only. The road is now open to one lane travel with pilot car. One lane of the road to Skagway is expected to be open Saturday afternoon.